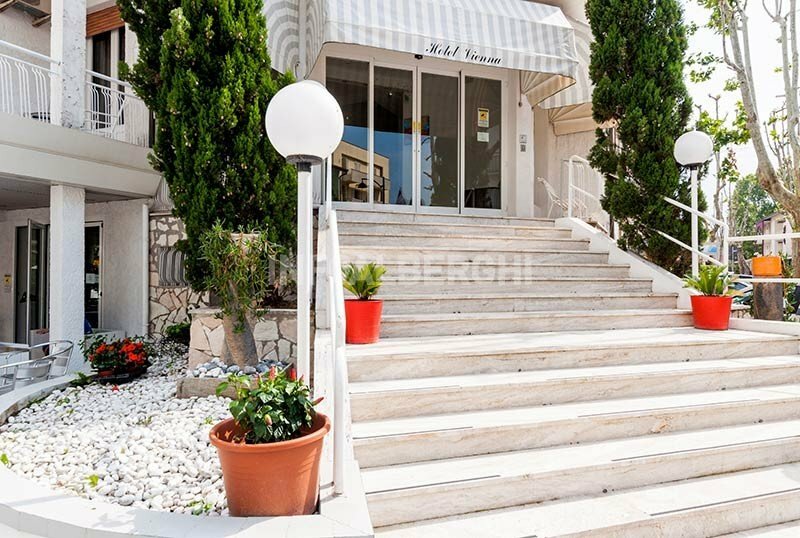 The Hotel Vienna is a 3-star hotel in Gatteo Mare, located in the central area near the beach. Newly run since 2018, it is family-run and offers free use bicycles, WI-FI and parking. Admits animals of small and medium size. The hotel is located in Gatteo Mare, a couple of minutes walk from the beach. The rooms are equipped with bathroom with shower (shower curtain in 3 rooms), hairdryer, TV, telephone, WI-FI, air conditioning / heating, safe, indoor clothesline, balcony (excluding attic rooms). On request: cot or cot, minibar. FAMILIES : family rooms are available. Outdoor relaxation area, free use of bicycles also with child seats, TV room, bar, restaurant, lift, weekly theme nights. PARKING : in a hotel with limited availability and for a fee, a few km free. WI-FI: in the common areas. CONVENTIONS: beach, Italia in Miniatura (miniature park). PETS: small and medium-sized pets allowed. BREAKFAST: sweet and savory buffet with bread and homemade desserts. LUNCH AND DINNER: local cuisine "farm-to-table" with a choice of meat, fish and vegetarian menus. Meals are buffet style with table service on request, water and wine are included. Pasta and desserts are homemade. At meals: baby menu on request, kitchenette for baby food with microwave, fridge and stove, high chairs. The hotel has an agreement with the Bagno Manuela n. 29, equipped with a disabled chair, live entertainment and WI-FI. The prices of the price list are per person per day for a stay min. of 2 nights. ALL INCLUSIVE: Full Board + Drinks at meals (water, soft drinks and house wine) + Beach Service (1 umbrella and 2 beds per room if occupied by two adults and 1 umbrella and 1 bed if occupied by a single adult). - Meals not consumed in the hotel are not reimbursed, in place of replacement and only a packed lunch will be prepared upon request. - In case of early departure, the customer is required to pay a penalty of 3 nights. - In case of cancellation of the reservation the deposit will not be returned.